The Auto Auction is Where Your Used Car Comes From! The Auto Auction. When you hear this term, what goes through your head? I’m willing to bet the majority of your impressions out there are less than favorable, that dealer car auctions are brimming with the worst of the worst. Cars that have been impounded, abandoned, repoed, unclaimed stolen vehicles, salvaged and flood damaged cars… the worst of the worst. And yes, there are auto auctions out there that carry these motorized misfits, police or insurance auctions for example. But the world of auto auctioning spans so much further. Did you know that nearly every single car will run through an auto auction at some point in its life? Sometimes more than once! There are a great many reasons why cars hit the auction block, many of them while still clean, young and healthy. For example, lease turn-ins and trade ins, often these clean, low-mileage cars end up at the auction. Other examples of clean auction cars are former rentals, zero mileage showroom floor models and dealer overstock. Cars like these finding their way to the auto auction is how dealers like Auto City get a vast majority of our fleet. However it is true that even at the dealer auctions, you will find some real junkers! Frame damaged cars, high mileage beaters, cars that have lived rough lives. Usually these are bid on by salvage yards, junk shops and parts dealers, thereby giving new life to other cars still on the road. But for dealerships like us, we’re after the clean cars. To find out more about this process, I was invited to spend a day at the Manheim Auction House in Oceanside, CA. Here is what I learned. Just recognized as Manheim’s 2018 Auction House of the Year, the San Diego County facility is the largest dealer auction in the region, but there are auction houses like this all over the country, serving licensed dealers that work both independently and for a dealership. Manheim San Diego in an 8 lane auction. On a busy day, all 8 lanes will be fired up at all times. Which means 8 auctioneers spitting cattle rattle through 8 mics on full blast, while buyers vie for the winning bid. It gets loud. Bring earplugs! It’s a fun, welcoming environment, these men and woman of the auto industry meeting here every week brings a familial feel to the place, as colleagues, peers and competitors all share the floor. There’s a pretty decent cafeteria, reminiscent of my elementary school’s. There’s also coffee and danishes available right on the lanes, and even free popcorn! I pretty much love any place that offers free food. There is a sports arena sized parking lot alongside the facility, where all the cars that will eventually be auctioned off today or in the weeks to come, are parked. Believe it or not there is some rhyme and reason to this parking. There’s a very specific order to these cars. Each car has a sticker which designates which lane the car will be heading down and in which order. They are parked accordingly. That way if a potential buyer is interested, they’ll know where to find it later. Other stickers indicate which business car came from, be it a dealership, rental company or otherwise. Usually each company that pays for time at the auction gets their own chunk of the parking lot. For example, I found a clump of clean Lexus cars that all came from a Lexus dealership’s trade-ins department. Potential bidders can walk the lot before the auction begins, checking out that day’s bounty. They can also inspect the cars while parked on the lot before the auction begins. There’s lot’s to see and some fantastic variety. I felt like a grown man at a car store… (get it? Kid in a candy store?) Some really clean high end cars offered at auction prices were very enticing. But I was equally impressed by the junkers. It never ceases to amaze me how far someone will go before buying a new car. Some of these were so beat up its a wonder they still ran. (again, these are not the cars we buy for the dealership!). But these wildly broken cars have a place in car culture, and for that, I really appreciated what I saw. While you don’t often see classics at a dealer auction, occasionally one will pop up. Just my luck, on the day I visit a crowd was gathered around a beautiful blue ’62 Thunderbird. It was in pristine condition. A real site to behold. Since cars like this Thunderbird don’t often make it to a dealer auction, it was being held off to the side for a special auction after the rest of the cars go through. I don’t know how it got there, or what became of it. All I know is it sure was purty. After perusing the lot and walking the 8 wild auction lanes, it was time to get a closer look at how things are done. Luckily, Ayrat Yunusov from Driveo was able to take us up to the auction block for a better view. Auto City’s sister company Driveo is a car buying and trade-in program offering top dollar for your old car. Often the cars sold to Driveo are reconditioned and re-sold to the public at Auto City. But for the cars that are just too old, have too many miles, need too much work, or if we’re just overstocked and don’t have time to recon them, they end up here at the auction. Each week Ayrat brings a fleet of cars to wholesale at the Auction. When it’s Driveo’s turn, Ayrat stands on the block with the auctioneers and monitors. While the fleet of Driveo cars roll through, the auctioneer works his magic to drive up the bid, in classic auction fashion. It’s exactly what you think it is in your head. They speak very fast in order to give sense of urgency. They create a rhythm and a signature rap to keep the flow going, using a series of phonetic syllables that, when broken down, is pretty much jibberish, but when thrown in with the numbers, is fascinating. This is known in the world of auctions as “Cattle Rattle”, a term that dates back to early livestock auctions. Meanwhile, there’s a man on the floor catching bids, acting as a sort of middle man between bidders and the auctioneer. There is a third person up on the block as well. She is keeping the computer up to date. All the information is relayed to a large TV screen above the block. Ayrat watches as the Driveo cars roll through. As the car reaches final call, and Ayrat is happy with the number, the car is sold. If the bid did not reach his minimum, the car returns to the parking lot, and we try again next week. He has final say. It all happens so fast, blink and you’ll miss it. For a newbie like me, it was difficult to keep up. Most of these cars sold in under 30 seconds. 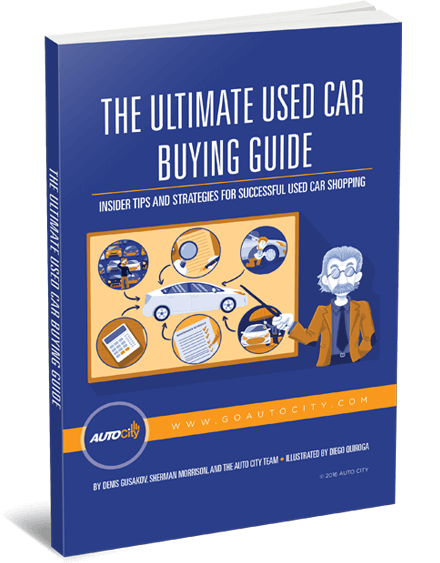 Auto City acquires about half of our used car inventory through auto auctions. But we’re not always there on the floor. Denis Gusakov, Auto City’s General Manager finds that bidding online rather than from the lanes is a more efficient use of time. That way, he can be present at multiple auctions at once, in a variety of regions across the country. Just as Ayrat and I were amid all the action and chaos at Manheim, Denis was bidding on cars as far away as Las Vegas, from the safe confines of the Auto City Offices. Again, there is a common misconception that an auction car a bad car. Almost every single car, at some point in it’s life will run through an auto auction line, at least once. There are many reasons why clean, healthy low mileage cars end up at auction. For example, lease turn-ins and trade-ins. The average lease in the United States is 3 years, 36,000 miles. Thousands upon thousands of leased cars are turned back into dealerships when there only a few years old with low miles. The dealership can turn around and re-sell these cars as certified pre-owned, but they can’t handle all that inventory, not every clean, low mileage lease turn-in will make it to teh CPO fleet. For the lease-turn ins that get turned away, they end up at the auction, and then to used car dealers like us. And no, not every car is a gem. There are plenty of junkers. Those cars gotta go somewhere too. Be it too old, too high mileage or too beat up for any reputable dealer to pick up. Many of them are auctioned off to parts vendors, salvage yards, or just someone willing and able to put in the time required to make the car like new again. The auto auction is simply a middle man between the two worlds, and a very necessary part of the automotive circle of life. 0 comment(s) so far on The Auto Auction is Where Your Used Car Comes From!